Although JADJ started off as a solitary effort, in my efforts to bring you quality content I've found that there are often people who are more knowledgeable, more talented, and more interesting than me. We've had a number of contributors and guest writers over the years and I'd like to thank them all. Joe moved to Japan in 2008, only planning to stay for a year. Little did he know the hold that Japan would have over him. 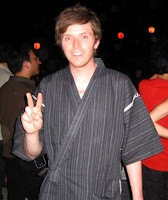 Joe continues to live in Japan while studying Japanese and vowing to one day reach the ranks of Tae Kim and Khatzomoto. He also enjoys traveling and seeing the many quirky sights unique to Japan.